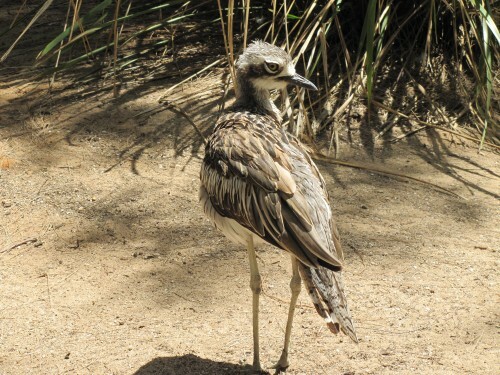 One of the more interesting birds on display in the Adelaide Zoo here in South Australia is this Bush Stone-curlew. Standing just over half a metre in height it is an imposing bird. This individual wanders around an open enclosure with Pelicans, a variety of ducks and some Cape Barren Geese. I am assuming it has had its wings clipped to keep it from flying off. Although this species is widespread throughout a large range across Australia, I have yet to see this bird in its natural environment. It is mainly active at night and most observers’ encounters with the species would be only hearing its haunting, far-reaching “weer-loo” call at night. Thanks for visiting my site Charles. They certainly are wonderful birds – how cool to have them visit every evening! I believe that on some of the Queensland Islands and even on the mainland, this species is common in large numbers. They are not particularly afraid of people in most situations, I understand.